Tuakana Teina with Room 13. Room 10 visits the scarecrows ! Today students drew a picture of themselves at school. Then I wrote a sentence for the students to copy underneath of. This introduces students to the direction that we write and a chance for us to discuss what a full stop is and why we use it. This week we have started reading ! Everyone in Room 10 has just read their very first reading book! 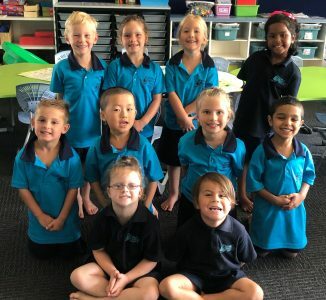 At this stage the students in Room 10 are learning to point to words as they say them and to locate words that repeat on each page – high frequency words. Say hello to Room 10! These smiley faces are the students starting the year in Room 10! If you see any of these new smiley faces around school , say hi and give them a big Stanley Ave welcome!